You could see Carlos Zambrano back on the baseball field soon. Zambrano won 132 games, including six straight seasons with at least 13 wins, and made three All-Star teams during a 12-year MLB career, but hasn’t pitched at the big-league level since 2012. Now 37, the longtime Chicago Cub has his eye on a comeback. Zambrano told the Chicago Sun-Times that he has a contract to play for the Chicago Dogs, an independent team based in Rosemont, Illinois. 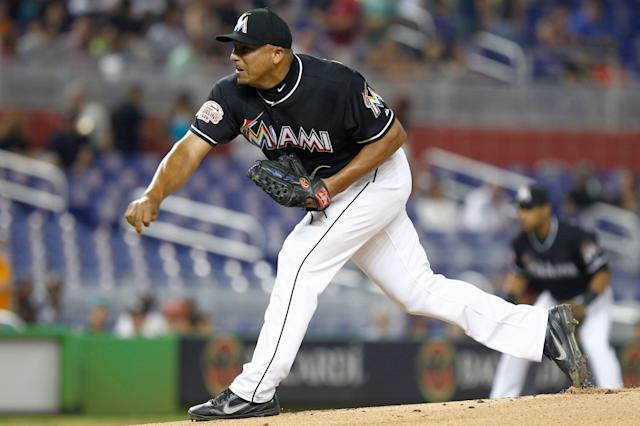 Zambrano most recently pitched in Mexico and in the Venezuelan Winter League without much success, but he says he’s serious about making it back to the highest level of the sport as a relief pitcher. “Why not? Bartolo [Colon] pitched until he was 45. I’m 37,” he told the Sun-Times. During his time in Chicago, Zambrano was known as much for his on-field and dugout outbursts of anger — including a fistfight with catcher Michael Barrett in 2007 — as much as his consistent output on the mound. But Zambrano says he is different now, and his faith is guiding him back to baseball. In the span of a few months in 2017 and into last year, he said four pastors from four churches in different parts of the world told him independently: “God wants you to go back to baseball.” By the time the third one said it, he wept. “It’s hard for me to cry, but a tear came down,” he said. Zambrano’s fastball sat in the upper 80s during his stint in the Mexican League, but now he says he can touch 94. During his time in Chicago, Zambrano had electric stuff while occupying a spot in the Cubs’ rotation with the likes of Kerry Wood and Mark Prior. But his behavior led to an unceremonious departure from the club. In 2011, after an outing in which he gave up five home runs, Zambrano was ejected. He then cleaned out his locker, left the stadium and told teammates he was retiring. It was his last time on the field as a Cub. The team suspended him and he was later traded to the Marlins. His year in Florida in 2012 was his last in the majors. He pitched seven games in the minors as a member of the Phillies organization in 2013, and then that was it — until 2019, perhaps. Zambrano told the Sun-Times he is headed to Chicago on May 2 for a physical. The Dogs begin their season on May 17.